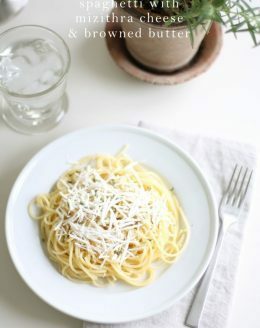 Spaghetti with Mizithra Cheese and Browned Butter is an easy weeknight dinner recipe, inspired by The Spaghetti Factory. Heat skillet to medium, add butter in chunks. Whisking, monitor the butter until it turns brown & has a nutty aroma, careful not to burn it. Remove the foam & toss with spaghetti. Top with freshly shredded mizithra cheese & garnish with parsley. You can find mizithra cheese online here, at gourmet grocers, cheese stores, markets like Dean & Deluca and The Spaghetti Factory sells freshly shredded to go. You can learn more about brown butter here and learn how in the video in this recipe card. Make it gluten free by using gluten-free noodles!